Visit McDonald's at 554/556 Christchurch Road, about a 1.81 mile distance east from the centre of Bournemouth, in Boscombe (near to Boscombe Bus Station and Sovereign Shopping Centre). The restaurant is a convenient addition to the areas of Pokesdown, West Cliff, Southbourne, Charminster, Bournemouth Town Centre, Iford, Littledown, Boscombe and Springbourne. If you'd like to drop by today (Thursday), its business times are from 6:00 am until 11:00 pm. On this page, you may find information about McDonald's Bournemouth, Boscombe, including the working hours, address or phone details. 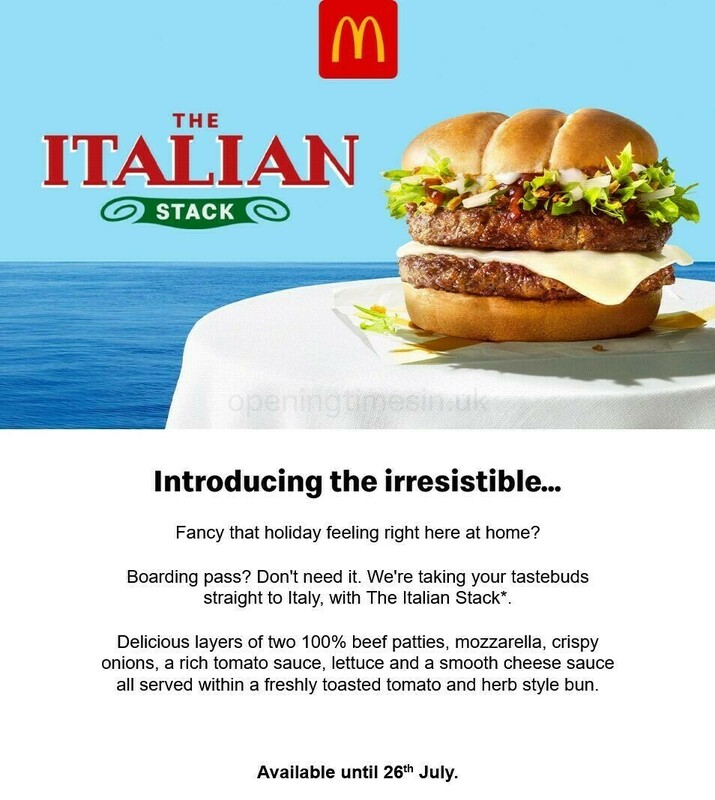 You may visit McDonald's near the roundabout of Centenary Way and Palmerston Road, in Boscombe, Bournemouth. Just a 1 minute drive from Parkwood Road/Southbourne Road, Sea Road, Ashley Road or Centenary Way; a 2 minute drive from Richmond Park Road/Alma Road or Wessex Way; and a 6 minute drive from Castle Lane West, Charminster Road and Barrack Road. To find the location using Satellite Navigation systems, key in BH1 4BH. Bus services have stops at Palmerston Road and Boscombe Bus Station. Routes: 2, 24, 26, 33, 41, 45, 755, 1a, 1b, 1c, 2a, 2b, 26a, N2, U3, X3 and m2. The train runs to and from Pokesdown Station (4260 ft) and Bournemouth Station (1.15 mi away). By the lines: CrossCountry and South West Trains. Within a couple miles you might visit Shelley Park, Churchill Gardens, Boscombe Chine Gardens, Kings Park Primary School, Kings Park Hospital, Knyveton Gardens and Bournemouth Collegiate School. McDonald's has 5 open branches in Bournemouth, Dorset. On the following link you can look over a complete directory of McDonald's locations near Bournemouth. Please note: over public holidays the opening times for McDonald's in Bournemouth, Boscombe may differ from regular times listed above. These updates consist of Xmas, New Year's Day, Easter Monday or Summer Bank Holiday. The quickest way to get verified information about holiday operating hours for McDonald's Bournemouth, Boscombe is to visit the official homepage, or call the direct number at 370 524 4622. The Opening Times in the UK team's goal is to provide you with the most up-to-date information. If you have found any discrepancies or errors in the location description or restaurant hours for McDonald's in Bournemouth, Boscombe, please make use of this form to report a problem. Your feedback on McDonald's is important. Please use the space and star scale below, to review the restaurant.